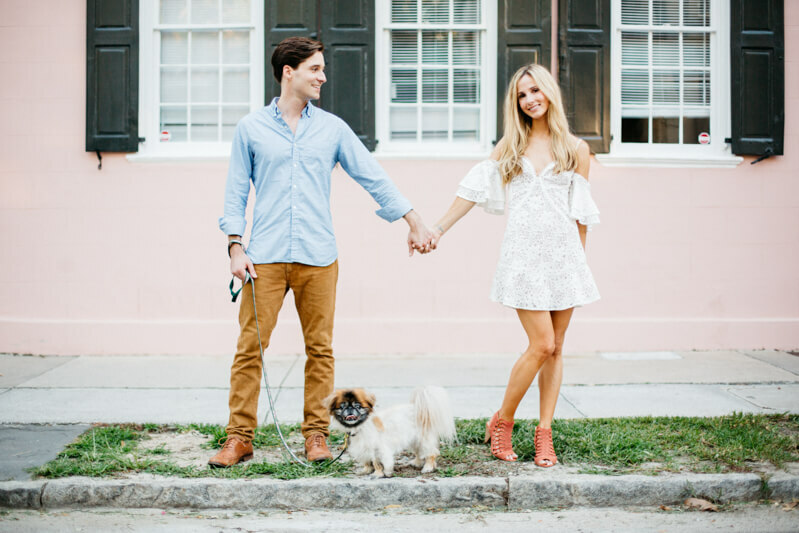 Elizabeth & Micah had their engagement session in downtown Charleston and Charleston battery. 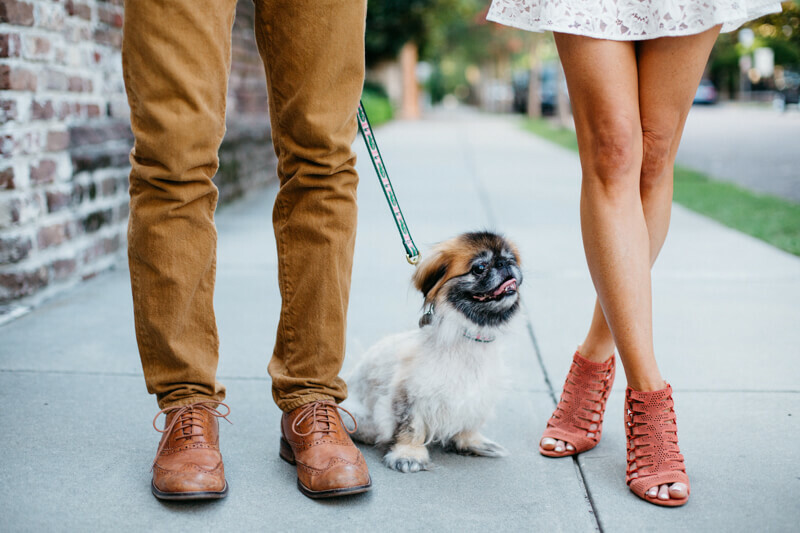 They brought their sweet pup along for some pics. A: Haha. Through a lovely algorithm. Tinder. Elizabeth was with her friend Blair & I met them both at Ra sushi in Atlanta. We had a blast that night & slowly built a friendship that turned into a lasting relationship. A: I know its cliche to say but we're best friends. We love adventure so anytime we get a chance to see something new we jump on the opportunity. Skiing is one of our favorite sports to do together when we travel. We love food. Whether its cooking dinner or trying a new hot spot in Atlanta. We both have a love for mezcal & tapas. That way we get a little taste of everything. Our dog Bella is a huge part of our lives, she pretty much does everything with us. We are each others biggest cheerleaders & are very passionate about living life to the fullest. Theres never a dull moment. A: I think we both connected in a way that we had never experienced before. It was pure & genuine. We took our time & started off as friends & that friendship grew stronger & stronger. We had some bumps along the road but through honest communication we surpassed those things & will continue to do so for the rest of our lives. 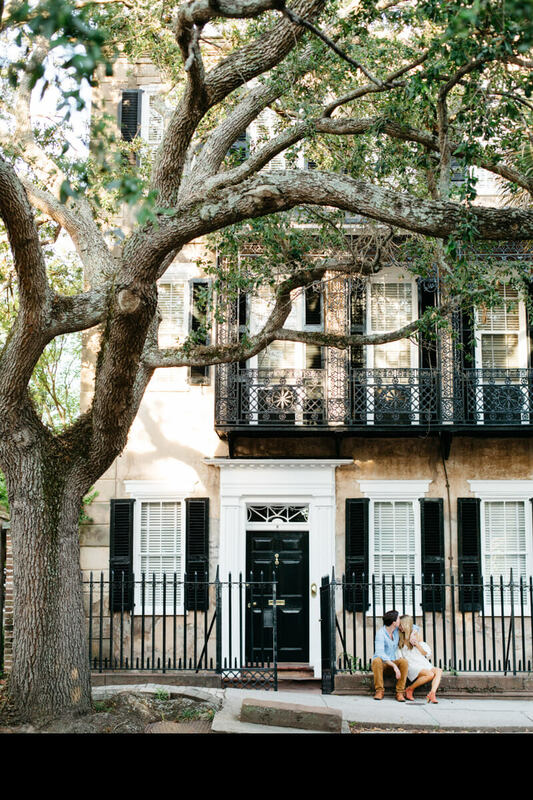 A: Elizabeth had never been to Charleston & I knew she would fall in love with it. I planned a couples trip to throw her off otherwise she would've known haha. When we arrived in Charleston we met up with our friends that were staying with us & drove around Charleston so that I could scope out a spot to propose. I told Elizabeth that our friends were going to do their own thing that night & we would go to a nice dinner. Once we were dressed I took her to walk around the battery overlooking the water. I spotted a park bench & walked her over to it. We sat down & I told her that "toot & I" had a conversation earlier(toot is our dog) & I asked her if I could be her daddy forever & then I said "I also had a conversation with your mom & told her how I wanted to spend the rest of my life with you"...thats when I got down on one knee & proposed. We were both on cloud 9. We called our parents & told them the news & celebrated with dinner at the Peninsula Grill. Q: We’re all about the bling… Tell us all about that ring! A: It is a 2 carat princess cut diamond from the diamond district of New York City. It's simple, elegant & I knew it would be perfect for Elizabeth. She loves it! Q: Are you excited to start planning your wedding day? Do you have any ideas in mind yet? 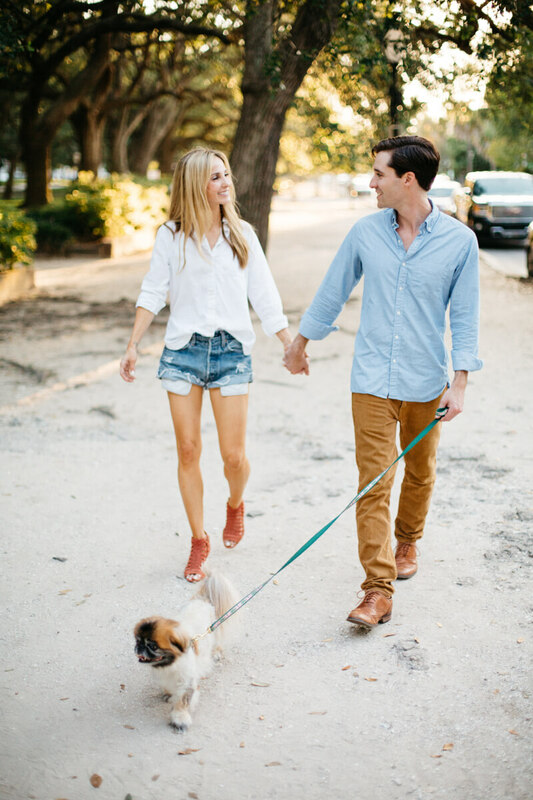 A: We have started the planning process & set the wedding date for 5/11/18 in Charleston, SC! We couldn't be more excited for this next chapter.